Can't make up your mind if you want vanilla or chocolate mugcake? That's fine, have both with this chocolate gradient mugcake! Combine ingredients except baking cocoa and mix well. Divide batter into thirds. Spoon 1/3rd of the batter into a small, oiled ramekin then set aside. add 1 tbsp baking cocoa to the rest of the batter and spoon half of this into another small oiled ramekin. Add one extra tbsp baking cocoa to the last portion if batter and spoon this into a third oiled ramekin. Microwave all 3 ramekins for 1min30 seconds then set aside to cool. For the filling, I combined a handful of diced strawberries with 1/4 cup coconut milk yogurt, 1 tsp vanilla, and a little cashew milk until smooth and creamy. 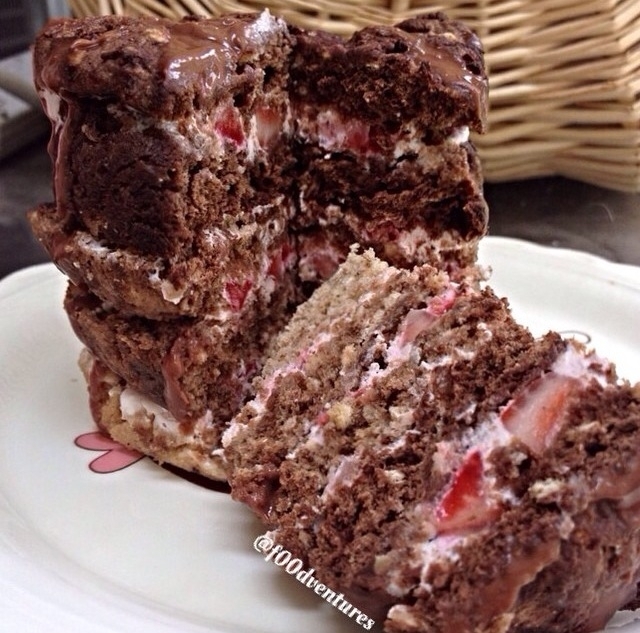 I layered this inbetween each mugcake layer then drizzled with about 1 tbsp dark chocolate dreams and topped off with a few strawberry slices.